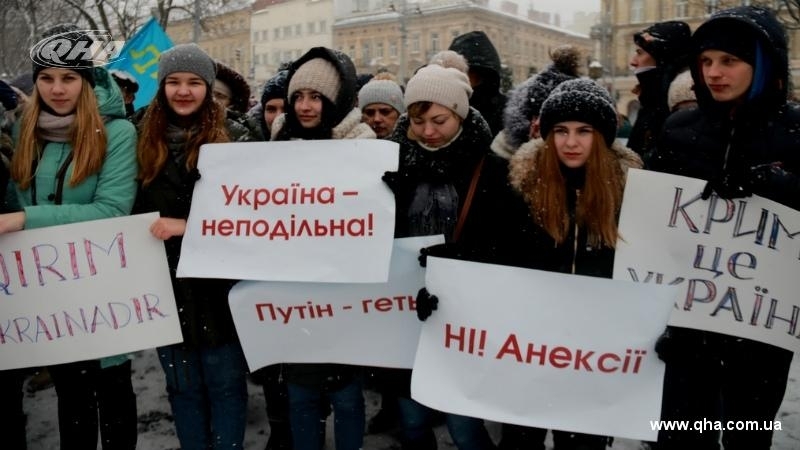 On Sunday, March 18, on the day of the election of the Russian Federation's precedent, mass rallies took place in Lviv against the holding of elections in the annexed Crimea. Most of the people gathered in the square near the monument to the great Ukrainian poet Taras Shevchenko, where the public assembly "No to the "elections" in Crimea!" they expressed their position. The event was also attended by the ex-political prisoner of the Kremlin Andrei Yatsenko, who noted the need to remember about the danger of a hybrid war every day. “The events in Crimea are connected with my personal history. When Russia occupied the Crimea, the special services of the occupier took me away from the hotel room just because I was an activist of the Maidan. I was the first Ukrainian political prisoner. A year of torture, punishment cells, single cells, cells with mentally ill people - but today I am with you. The faster we understand that we need to act rationally, the faster we will save ourselves. We must understand that a hybrid war is not just military action, it is an information war. Our mission is to convey the truth to the international community. Ukraine has not forgotten about the Crimea. This is our integral part," said the current Adviser to the Minister of Foreign Affairs of Ukraine. "Unless we ourselves remind the aggressor that we exist and that we do not agree, then we have no right to demand support or active action from Europe or the US. Even with such actions in the cities, we support our national spirit and those conscious Ukrainians and Crimean Tatars who stayed on the territory of the Crimea and are fighting against the invader back-to-back," Natalya believes.